If you put the word ‘thankful’ into an internet search engine you get any number of results. But this morning, my favorite was from the Merriam-Webster dictionary website: glad that something has happened or not happened, that something or someone exists, etc. Thankful that someone exists…what an incredible sentiment. This year we have much to be thankful for. Here in Cape May, we are thankful that we get to live in one of the most beautiful places in the country. We are thankful for our birding community, the birders who travel to visit us each year, and of course, the birds! We are thankful we have the time and energy to be outside and exploring. We are thankful that we live in an age where we can communicate and support one another from the other side of the world. We are thankful for the moments we get to spend with our friends and families, and the memories we share with those who left us too soon. Personally, I am thankful for the guidance from mentors who have helped me become a better naturalist, a better teacher, and a better person. I am thankful for a supportive collection of friends who have welcomed me into their hearts and homes. I am thankful that I get to do what I love and share it with like-minded people. But most of all, I am thankful for the beauty and goodness I find in the world everyday. From all of us here at Cape May Bird Observatory, we thank you for your support and friendship, and we wish you a very Happy Thanksgiving. Franklin’s Gulls are in town! Thanks to strong storm systems working their way east across the country, Cape May (and the East Coast in general) has experienced the greatest influx of Franklin’s Gulls it’s ever known. 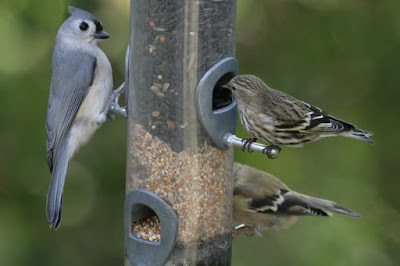 These birds aren’t exactly annual visitors, though we do get a couple every 2 to 3 years, typically as rare vagrants. The previous NJ record of Franklin's Gulls was another storm-driven invasion from November 14-15, 1998 of 50+ birds between Avalon and Cape May. 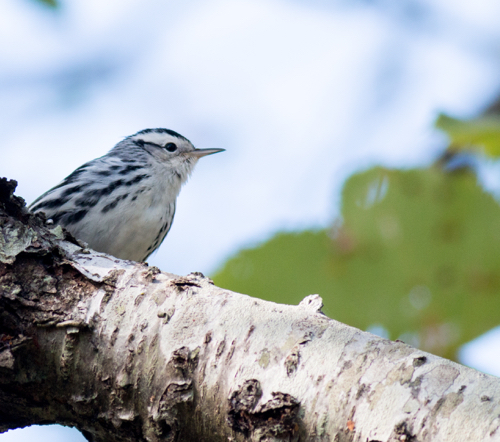 A group of 3 individuals were reported in 2005, but all other records are of single birds. However, after reviewing information complied from eBird reports, photos, and personal accounts, it’s estimated that Cape May County saw roughly 350 Franklin’s Gulls yesterday. eBird reports of Franklin's Gulls from November 2014. A single individual was spotted at the Avalon Seawatch and another individual hung out for about 10 days at a Waste Water Treatment reservoir in Maryland, but the rest of the east coast is barren. eBird reports of Franklin Gulls from November 2015. As you can see the entire Northeast and East Coast has been invaded by vagrants pushed east by recent storms. Birders here in Cape May had been watching the weather and the numerous reports of Franklin’s Gulls west of us all week, salivating at the idea of a good invasion. 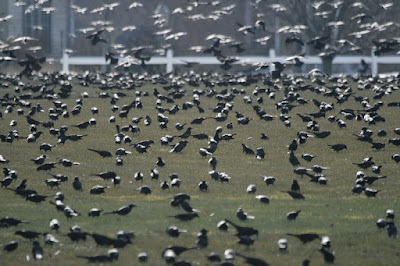 It started Friday morning with flocks of anywhere from 4 to 15 just off shore at Coral Avenue. Then reports started coming in from the Hawkwatch, Sunset Beach, and the Avalon Seawatch: we were indeed being invaded! Later in the afternoon, Megan Crewe found a flock of 62 sitting on the ocean off of Cape May City. 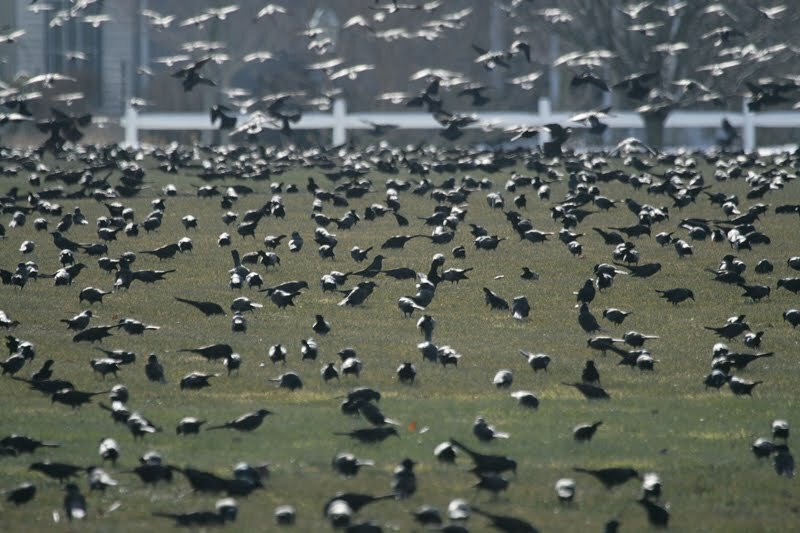 That flock lifted up and was spotted by observers kettling over the Grand Hotel, over The Nature Conservancy’s South Cape May Meadows, and eventually out towards the Delaware Bay. A couple Franklin’s Gulls have even been cooperative enough to hang out at the Cape May-Lewes Ferry Terminal, close enough for great photographs. It was a race all over town for birders to get Franklin’s Gull on their yard lists, office lists, county lists, and even life lists. Today, the Franklin Gull show has died down considerably, with a few still being spotted here and there (including the Ferry terminal). Saturday’s excitement belongs to Cave Swallows, with over 400 counted from Coral Avenue as of 1:00pm today. We have two sub-species of these beautiful little birds in North America: populations throughout Texas and one down at the very southern tip of Florida. Nowadays, we regularly get an influx of Cave Swallows along the East Coast and the southern Great Lakes that expand their ranges northward at the end of the breeding season to exploit food resources. 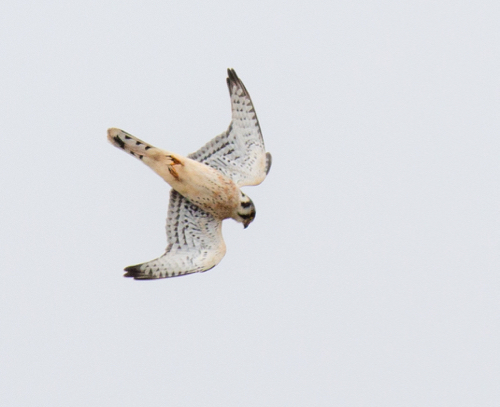 This year however, like the Franklin’s Gulls, we have experienced unprecedented numbers. Yes, November is the time for rarities and invasions. Come on down and see for yourself! It’s November: the time of year when the trees become bare, sweaters and hats become necessities (usually), and the locals reclaim their town. Yes, all of our seasonal naturalists and visiting fall birders have packed up and moved home, leaving nothing but the counters, the staff, and a barren Hawkwatch platform behind. The weather isn’t the only one to blame for the mass exodus of friendly faces though; November has always been known as the beginning of the end for Fall migration here in Cape May…but is it? It is true that it has been miserably slow at the Hawkwatch on the Point, with just over 500 birds tallied since the start of the month. However, the Avalon Seawatch is cruising steadily with very close flocks of Scoters, Gannets, and Red-throated Loons. As someone who doesn’t have an immense amount of experience seawatching, I find it almost magical to watch a flock of 250 Surf Scoters flyby in their stacked formation, so close that you can see their skunk-heads without bins. I still gasp every time I watch a handsome Northern Gannet dramatically plunge-dive into the water. And I can’t help but smile as I count a loose squadron of delicate looking Red-throated Loons that somehow manage to be awkward and graceful at the same time. Common Loons, though not as numerous as Red-throated Loons, can also be observed in Avalon. 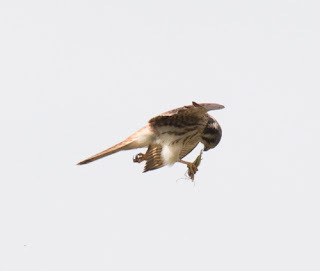 These birds have an overall chunkier look to them, with big, obvious feet and a large bill. This individual came directly over the jetty in front of the CMBO Seawatch shack. [Photo by Sam Wilson]. Since November 1st, those of us who have visited Avalon have been treated to flyby Harlequin Ducks, the first real movement of Long-tailed Ducks, over 22,500 Northern Gannets, and over 30,500 Scoters, not to mention the numerous Hump-backed Whales putting on a show just off-shore! In fact, Thursday’s Northern Gannet flight set a new single-day record for the 2015 season with a total of 11,705 tallied all day. Even more impressive is that over 8,500 of those birds came by between 7:00 and 9:00am--that comes to nearly 72 birds per minute (I did the math)! If you find yourself with some time this weekend, take a visit up to Avalon between the 8th and 9th street beach accesses and see the spectacle for yourself. As exciting and busy as the Avalon Seawatch shack-mahal currently is, the Hawkwatch platform has become a lonely place, especially without the infectious enthusiasm of our interpretive naturalists. Tara, Erin, and Jacob have all moved on to their next adventures: from cross-country road trips to birding excursions, they have scattered back from whence they came. On behalf of all of us here at CMBO and the visitors they helped orient and teach, I would like to take this opportunity to thank them for the hard work and dedication they put in to sharing their knowledge of birds, migration, and conservation. I hope the three of them learned as much as they taught and they will look back on this season at CMBO with great fondness. Just remember, once you’re here, you will always be a part of the Cape May birding community, whether you like it or not! So Tara, Erin, and Jacob: we wish you the best of luck in all your future endeavors and please remember to come back to visit us!